Create two new product lines and bring high-touch financial and tax management to thousands of fraternities and sororities. Columbus, GA – March 15, 2018. 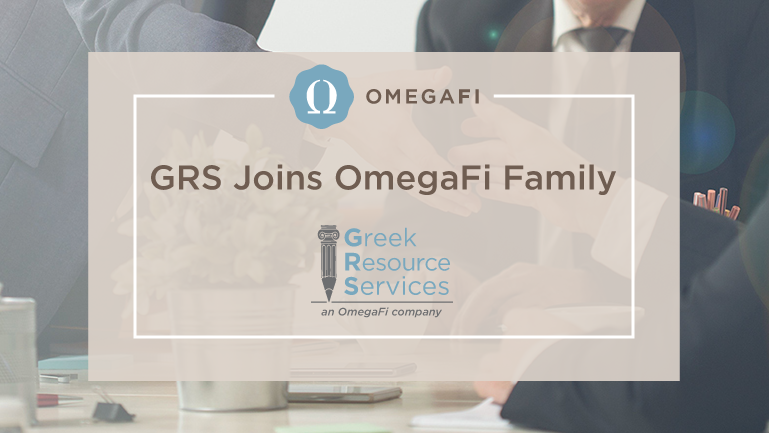 OmegaFi and Greek Resource Services announce a merger between the companies, bringing an unparalleled level of financial technology, service and support to fraternity and sorority chapters, house corporations and headquarter entities. Greek Resource Services, known throughout the fraternal community for offering superior, hands-on accounting services, will continue to do what they have always done best, providing the highest touch-service available. They will continue to operate from their Tuscaloosa, Alabama office and will soon introduce some of OmegaFi's cutting-edge technology to their customers. "With OmegaFi's technology, we'll be able to save chapters and house corporations time and money while offering even more transparency and payment collection methods," explained John Murdock, president of Greek Resource Services. In turn, OmegaFi will bring Greek Resource Services’ hands-on financial management solutions and in-depth knowledge of tax filing and tax status compliance to the thousands of chapters and housing corporations working with OmegaFi. As a result of this merger, OmegaFi will launch two new solutions for organization management. The first is VaultPro – a hands on financial management and professional accounting service that will offer all the great benefits that now exist within Vault as well as third-party bank reconciliation, detailed monthly financial reporting, active management of the day-to-day finances and much more. The second new offering will be known as 990Pro – professional 990 tax filing services that can include, a real system and team of experts to help reinstate chapters who have lost their tax exempt status. OmegaFi CEO Fred Maglione shared his thoughts on the new partnership: “For years, customers have been asking for help with 990 tax compliance, and so many are looking for more than just a financial management software platform. They've been asking for a resource to actively manage their finances with them. Coming together with Greek Resource Services allows us to provide an enhanced service offering that does not exist anywhere in the industry today. John and I are both excited about the value we'll be able to provide to officers, advisors and headquarters staff." At the intersection of fintech and fraternity, OmegaFi, headquartered in Columbus, Georgia, provides financial and communication software, payment solutions and support for fraternities and sororities across the United States. Their innovative tools, expertise and customer-centered approach help fraternal chapters, house corporations, headquarters and foundations optimize operational efficiency and increase revenue. Partnering with OmegaFi provides administrative relief and support allowing key officers and staff members to focus on mission-driven priorities.